Do you find it a PAIN to keep up with OSHA recordkeeping standards? Do you wonder if you are doing it right – or all wrong? Do you wish you had straightforward, compliant, OSHA recordkeeping training? 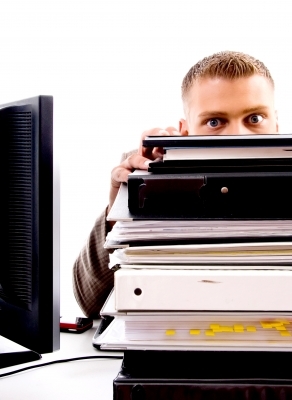 Do you wish you did not have to learn about OSHA record keeping the hard way? You’re not alone – many safety coordinators, job site supervisors, and others involved with OSHA recordkeeping are always looking to become more proficient at this important process. Training record renewals, transfers, etc. CertifyMe.net offers an “OSHA Recordkeeping for Managers and Supervisors” course that covers all the basics of OSHA recordkeeping. Upon completion, you’ll receive an official OSHA recordkeeping certification upon successful course completion. CertifyMe.net is a recognized leader in forklift training, pallet jack instruction, manlift operation and more – and now, our OSHA recordkeeping training helps “close the loop” with all of your internal safety records. In the event of an accident or other mishap, OSHA requires a full record of all safety training logs. With our OSHA recordkeeping requirements, you don’t have to worry filling the gaps or trying to satisfy inspector demands. Here’s something many employers aren’t aware of: OSHA fines for recordkeeping violations can be severe. OSHA’s recordkeeping standards require that managers, safety supervisors, and other personnel track and document everything related to your company’s safety policies. Why risk thousands of dollars in fines and penalties, simply because you weren’t aware of OSHA recordkeeping requirements? In today’s hyper-regulated job environment, there’s simply no excuse to be in the dark about OSHA recordkeeping. That’s were OSHA recordkeeping training from CertifyMe.net comes into play. Once you and your training supervisors are done with our OSHA recordkeeping course, you’ll have all the required knowledge to store, access and select any training record, from any employee! OSHA requires employers to record and report all work-related illnesses, injuries and fatalities. OSHA, employers and workers use such information to evaluate workplace safety hazards and implement protections to eliminate, or at least, reduce hazards. Reporting an incident does not mean that the employer was at fault or has violated OSHA rules, nor does it mean that the employee has a right to receive workers’ compensation or other benefits. Expansion of list of severe work-related injuries that must be reported by covered employees. For the first update, the list of industries was changed in regards to the basis for classification. The old list was based on the Standard Industrial Classification system and injury from the BLS from 1996-1998. The updated list now exempts industries based on the North American Industry Classification system, and injury and illness data from the BLS from 2007-2009. For low-hazard industries and companies with ten or fewer employees, OSHA recordkeeping standards don’t apply. The second update expands on the old list of severe work-related injuries that employees not exempted must report to OSHA. The updated rule maintains the requirement for employers to report all fatalities within 8 hours of occurrence and adds a new requirement for employers to report all work-related in-patient hospitalizations, amputations, and loss of an eye within 24 hours to OSHA. Sign up today, and ensure your recordkeeping requirements are good to go! How Do Employers Report to OSHA? All employers need to report work-related fatalities within 8 hours as well as in-patient hospitalizations, amputations, and loss of an eye. Employers can report these incidences to OSHA either by calling their free and confidential number at 1-800-321-6742, calling your closest area office during business hours, or by using the new online form. What Information is Required When Reporting? Reporting incident if the fatality occurred within 30 days of the incident. If an employee suffers an injury falling out of his truck in the company parking lot, it is part of the work environment and you must report it, depending on OSHA recordkeeping criteria. If a worker suffers an injury on company property outside his assigned working hours, it is reportable under OSHA record keeping requirements. If the employee suffers an illness or injury on company premises outside his assigned working hours and is performing personal tasks unrelated to their employment, this might not be reportable under OSHA recordkeeping criteria. Don’t be! Get the FACTS. Discover the details of OSHA recordkeeping requirements. See examples of actual workplace incidents that demonstrate a manager’s responsibilities in documenting and reporting. If you’re at all worried with not complying with OSHA recordkeeping standards, then don’t take any chances and complete OSHA recordkeeping training. Knowing that you understand all of the rules fully and that you are well-equipped to keep the records of your employees and workplace in accordance with OSHA’s many standards, you can eliminate all risks of fines and legalities. Your employees will also enjoy peace of mind on the job and fair treatment since all accidents and injuries will be well documented so OSHA can properly look into the causes and safety of the work environment. If you fail to accurately document your records, your company will suffer with audits, fines, and penalties. Give your safety program an extra measure of protection – and future financial stability – with our “OSHA Recordkeeping for Managers and Supervisors” course! OSHA recordkeeping training teaches employers exactly how to follow OSHA protocols to avoid investigations and fines. Not only does it help employers protect their business and avoid trouble with OSHA but it also helps create a safer workplace and heightened well-being of the employees. Our OSHA recordkeeping requirements complement our industrial vehicle training classes. Because all of our forklift, pallet jack and other training courses are accessible online anytime, you can always print out the most recent, up-to-date training records. Think of CertifyMe.net as the ultimate “backup disc” for all of your OSHA recordkeeping training needs! What’s more, CertifyMe.net also has a complete assortment of OSHA training certification classes to complement our forklift training and OSHA recordkeeping requirements. These include asbestos awareness training, defensive driving training, 8 hour HAZWOPER training, and much more. CertifyMe.net is the best single source for meeting and complying with all OSHA safety standards. Don’t delay and get started today! Contact us for more question, or get started here! If you have any questions about our OSHA recordkeeping training, or would like to speak with our OSHA training consultants, give us call today at 1-888-699-4800. Thanks for visiting CertifyMe.net!